On Tone 3 we bring a new Intention to Life. Our first Movement toward an Intention creates a Vibration that follows its own course of Manifestation. Our first step will lead us to the next. Tone 3 births a Dream into the realm of physicality to chart our course from Point A to Point B. Our Self-Expression births a Personification of Spirit that is capable of Creation, as long as we continue to move forward as each step is presented. We were created for the Purpose of Relationship. The Mind draws knowledge by comparison. We are able to “Know Thyself” through a comparison to something else. The Creator is made capable to Know itself through a relationship with Human. Offering/MULUC is the Day Sign of Atonement. An Offering of our Self reunites us with the Creator. Acting on a Choice to let go of our Own Way, we become an Expression of a Divine Creator. MULUC is a symbol of the Moon, our emotions, and water everywhere from the Cosmos to our Tears. The glyph illustrates a single drop suspended above the Whole. A Sacred Offering is a Time and Place of Human Consciousness of the Creator. We are Present in a Holy Communion with Unconditional Love that brings Healing and Purification. As we are returned as One we extend ripples of Love through the Whole. Through our emotions, we allow the Creator to share our Authentic Experience of Being. Through our emotions we are in Communion through the Language of the Heart. Water is the Substance that holds the Ether of Spirit. MULUC represents the Element of Fire. The Fire of Spirit moves through our Heart and our tears are Holy Water. Water is the Substance that is used for the rituals of Baptism and Purification. An Offering is an Expression of Appreciation. Offering people are Happy to Give more than they ask for themselves. Through a sacrifice of our Self, we are Atoned as the Living Water of the Creator. A single drop can Transform the nature of the Whole. The Deer/LAMAT trecena draws us into an Intention of Divine Service. As a Living Sacrifice we draw the Light of the Creator to the Whole. The Cherokee Day Sign, the River, is related to the Milky Way. The River was the place “Where the Dog Ran” to gather the souls for Heaven. The River is the Living Water that carries us to Oneness in the Sea. When we surrender our own Way, we are Free to Move with the Current of Divine Spirit. 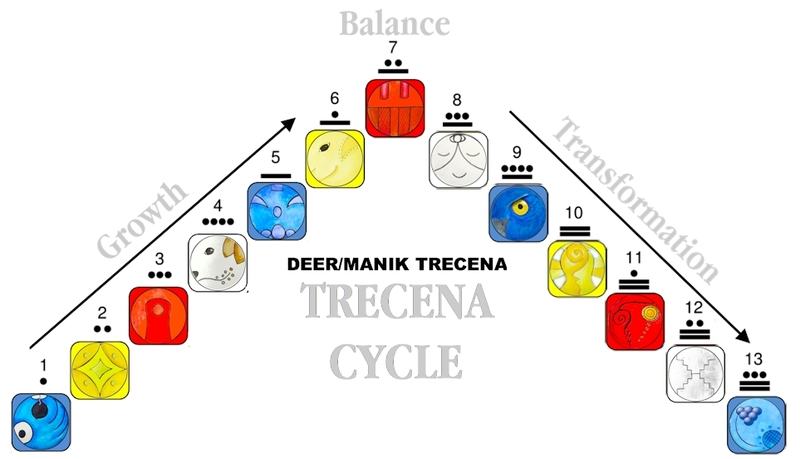 Tone 3 of the Deer/MANIK trecena shows us the Way to Move as the Hand of God. We Let Go so we can Let God direct our movement. Through an Atonement we will Know the Divine Discernment that will guide each step forward. As One, we are capable of the Unlimited Possibility of Divine Creation. Today is a day to Honor our Emotions and the Emotions of others. Through the genuine expression of our Feelings, the Creator Knows our Human Experience of Creation. Our Communion is a two-way conversation. As the Creator shares our Human Experience, so does Human Experience the Creator’s Unconditional Love. Being One with the Creator doesn’t require us to be perfect. The Humility of Surrender is our first step toward serving as the Hand of God. Our Divinity is established through an Intention to Serve as the Vessel. We don’t have to know the next step. We will be guided by an Inner Knowing of Divine Discernment. 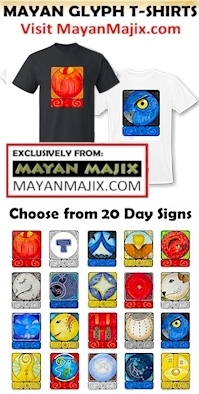 The Cherokee Day Sign, The River, is the “Fountain of Life” with the energy to clear all karmic debts, both personally, and on a mass level. Rivers are a symbol of perpetual motion, cycles, and change. It’s said that you never see the same river twice. The Love the Creator is eternal in its path while new in every moment. To all my relations, may we Humble our Self in the Moment to draw Healing and Purification through the Atonement of a Sacred Offering. May we Acknowledge the Blessing of Water everywhere we see it as the Element that holds the Ether of a Living Spirit, that moves with us and around us to carry us to the Unity of the Whole. Like the sprout, may we our effort of Spiritual Growth be carried by a Divine Strength that exceeds our vulnerability. Through a Sacred Offering, may we be Purified and Atoned to become the Vessel through which the Creator extends its Blessing to the Whole. May we be willing to open our Heart establish a Communion with the Creator so our steps would be guided by Divine Discernment.